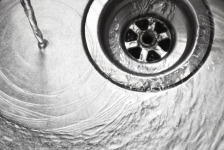 Many people do not think to have their drain cleaned until they have a clog. But in fact a lot of times there are signs. Be aware. Paying attention can save you time, money, frustration, and a mess! Slow Drains: Over time as hair, waste, or debris sticks to the walls of the drain pipe this causes water flow to be restricted and will cause the drain to drain more and more slowly. This is a sign that it’s time for a cleaning. If you act quick enough and call Micro Plumbing, Inc. you will be likely to prevent a fully clogged line. Bad Smells: As different kinds of waste sticks to the walls of a pipe, it can give off a bad smell. This is especially true in bathrooms or kitchens. This happens very frequently because of food, soaps, and hair. If you do smell a foul stench it may warrant a call to Micro Plumbing, Inc. to have your drain clean before it backs up. If you find yourself with the regularity of clogs, it may be something more serious with a potential break in a line or even an obstruction in the line such as roots. This is something that should be attended to and to not wait. This is a situation that can have large ramifications and a professional from Micro Plumbing, Inc. should look at immediately.